Nutrition Highlights: All canned beans are rich in protein, fiber, potassium and numerous antioxidants. Peel the squash and cut into 1/2-inch cubes. Place the oil in a stockpot over medium heat; add the onion and squash and sauté until translucent. Add the garlic and sauté for one additional minute. Add the sherry and then the stock. Simmer until the squash is soft. Purée the soup until smooth. Or for a slightly chunky soup, retain some of the squash and add back to the pureed soup. Add the beans, cumin and thyme. Season with salt and pepper. Garnish with the fresh cilantro and scallions. Top with sour cream, if desired. Nutrition Facts (per serving): Calories – 437, Fat – 8.6g, Dietary Fiber – 8.8g, Protein – 51.9g, Vitamin A – 77%, Vitamin C – 19%, Calcium – 11%, Iron – 25%. Slash sodium by up to 45 percent by rinsing beans thoroughly. 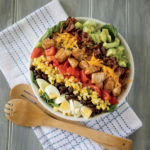 What a great idea to use black beans! 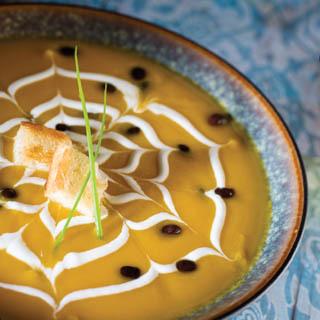 Part from the visual appeal the black beans give to the soup, I bet they taste really good with the butternut squash! Thanks for sharing this with Sunday Night Soup Night, look forward to seeing you again soon!